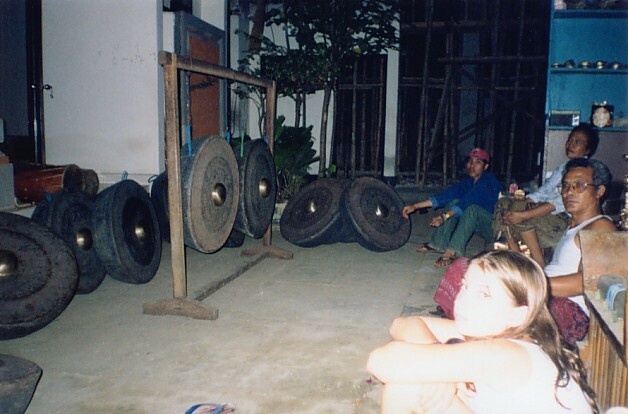 Ever since we'd seen those big gongs in Blahbatuh, we'd been thinking about getting one for our gamelan. The large Javanese gong we'd been borrowing from UCSC's Sundanese gamelan was cracked and beginning to lose its sound quality, and we had always felt we should have our own gongs anyway and not have to borrow. It turned out that Steve had been thinking exactly the same thing, so we asked our friend and teacher I Nyoman Sedana about buying gongs. He eagerly agreed to come with us and help us find some good gongs. We got a driver, and Sedana directed us to the village of Tihinggan - a sleepy little village in the Balinese countryside - where it turned out that almost every other house was a gong store! None of them seemed marked as a gongsmith - you just knocked on the door and were invited into the compound where they had gongs stored. We went from house to house, looking at and listening to one gong after another. We had brought with us a recording of our own gamelan in the States, and we played it back over and over to try to find a gong that would sound good together with our gamelan. We must have visited at least a dozen gongsmiths, and listened to 50 or 60 different gongs. This photo was taken at a place we came to call "Gongs 'R' Us". They had a huge supply of gongs - room after room, packed with gongs, which they patiently pulled out one by one, hung up on the stand and listened to, each time shaking their heads as they compared the sound of the gong with the recording of our gamelan. We were impressed that they seemed less interested in selling us a gong than in making sure we got a gong that matched our gamelan, and, after spending well over an hour with us, were not at all miffed that we didn't buy a gong from them. They agreed that none of their gongs fit our gamelan. We finally found the right gongs in a couple of small places that only had one or two gongs each. We decided to go back to "Gongs 'R' Us" to buy a couple of gong stands. Our driver thought we were crazy - we'd kept him waiting for hours while we traipsed from door to door. When we came staggering back, loaded down with a pair of heavy gongs and a bundle of poles that formed the gong stands, his suspicions were confirmed! Sedana was delighted with the little time-keeping pot we gave him as a thank-you present for helping us out.